The enhanced vision system market is projected to grow from USD 202.7 Million in 2016 to USD 250.4 Million by 2021, at a CAGR of 4.32% during the forecast period. The objective of this study is to analyze, define, describe, and forecast the market based on technology, component, platform, and region. The report also focuses on the competitive landscape of this market by profiling companies based on their financial position, product portfolio, growth strategies, and analyzing their core competencies and market share to anticipate the degree of competition prevailing in the market. 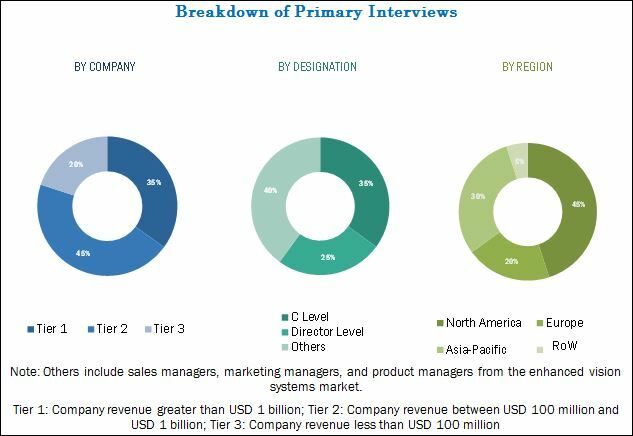 This report also tracks and analyzes competitive developments, such as partnerships, mergers & acquisitions, new product developments, and research & development (R&D) activities in the enhanced vision system market. While 2014 has been considered as the base year, the duration between 2016 and 2021 has been considered as the forecast period for this market study. The ecosystem of the enhanced vision systems market comprises platform, technology, and component industries. The enhanced vision systems value chain includes component suppliers, such as Honeywell International, Inc. (U.S.), United Technologies Corporation (U.S.), L-3 Communications Holdings, Inc. (U.S.), Thales Group (France), Elbit Systems Ltd. (Israel), Rockwell Collins, Inc. (U.S.), Esterline Technologies Corporation (U.S.), and Astronics Corporation (U.S.). Dassault Falcon Jets Corp. (U.S.), Gulfstream Aerospace Corporation (U.S.), Bombardier Inc. (Canada), and Embraer SA (Brazil) are some of the aircraft manufacturers using enhanced vision systems manufactured by the various component suppliers listed above. Acquisitions and new product launches are the major strategies adopted by key players operational in the market. The enhanced vision system market is expected to grow from USD 202.7 Million in 2016 to USD 250.4 Million by 2021, at a CAGR of 4.32% during the forecast period. Aircraft safety, situational awareness, and reliable operations at low visibility are factors driving the growth of the market. Key players operating in the market are Honeywell International, Inc. (U.S.), United Technologies Corporation (U.S.), L-3 Communications Holdings, Inc. (U.S.), Thales Group (France), and Elbit Systems Ltd. (Israel). Based on technology, the enhanced vision system market has been segmented into infrared, synthetic vision, global positioning system, and millimeter wave radar. The millimeter wave radar segment of the market is expected to grow at the highest CAGR during the forecast period. Pilots have to depend on active sensors like millimeter wave (MMW) radars for reliable vision and safe navigation. Among all imaging sensors, the most promising one for enhanced vision systems is the imaging MMW radar as it has the lowest weather dependency. This factor is anticipated to drive the millimeter wave radar segment. Based on component, the display segment is projected to account for the largest share of the enhanced vision system market during the forecast period. A display unit serves as a screen for graphical representation of data collected from various sensors onboard an aircraft, and is a crucial component of the enhanced vision systems. This is one of the key factors propelling the growth of this segment. North America is expected to lead the enhanced vision system market during the forecast period. Countries in this region include the U.S. and Canada. The market in North America is driven by the large number of original component manufacturers (OCMs) and original equipment manufacturers (OEMs), major technological upgradation of existing equipment by key players, and the presence of key market players, such as Honeywell International, Inc. (U.S.), United Technologies Corporation (U.S.), and L-3 Communications Holdings, Inc. (U.S.). Whereas, the Asia-Pacific market is projected to grow at the highest CAGR during the forecast period. This high growth can be attributed to the presence of large OEMs, such as HALBIT Avionics Private Limited (India) and Samtel Group (India), demand for increased safety and reliable airline operations, and fluctuating weather conditions in the region. Aircraft manufacturers as well as OEMs need high initial capital to set up machinery, skilled workforce, state-of-the-art technical equipment, and integration platforms. Manufactured components also need to be approved by various authorities before they are installed on board the aircraft. Besides, it is difficult to obtain approval for the replacement of conventional systems with electric systems in an aircraft. These act as major restraints for the growth of the enhanced vision system market. 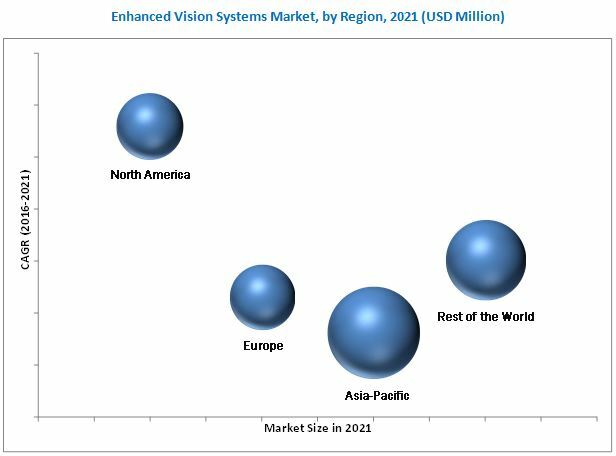 The enhanced vision system market is a diversified and competitive market with a large number of players. Key players operating in the market are Honeywell International, Inc. (U.S.), United Technologies Corporation (U.S.), L-3 Communications Holdings, Inc. (U.S.), Thales Group (France), and Elbit Systems Ltd. (Israel). Honeywell International, Inc. holds 27% share of the enhanced vision system market. Market players focus on entering new markets by launching technologically advanced & cost-effective products and acquiring new businesses. 12.4 L-3 Communications Holdings, Inc.